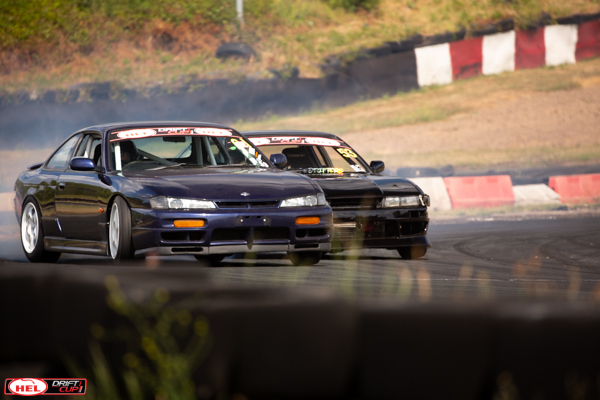 Round 4 of the 2018 HEL Performance Driftcup returned to Teesside Autodrome, the birth place of the British Drift Championship. 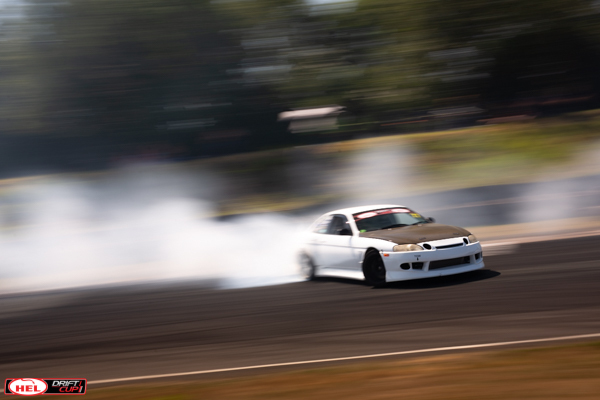 The layout for this round is the same that the British Drift Championship recently used, giving the drivers a direct comparison between their runs and seeing if they are up to the challenge. The track has a long run up before flicking the car onto clip one which the drivers then have to maintain their speed to run up the small banking and onto clip two on the outside of the corner. 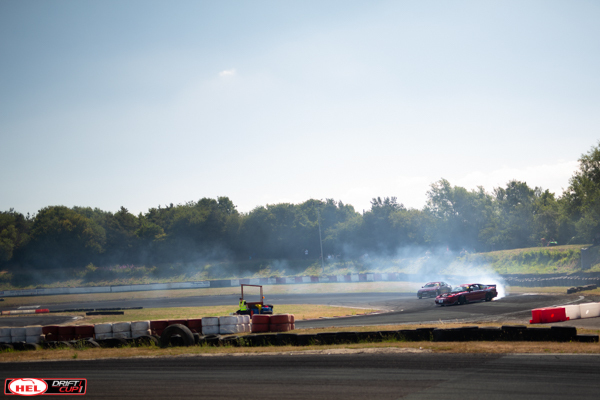 The drivers then had to power away from the edge of the track in order to stretch the drift out to clip three before the first hairpin which also featured clip four. 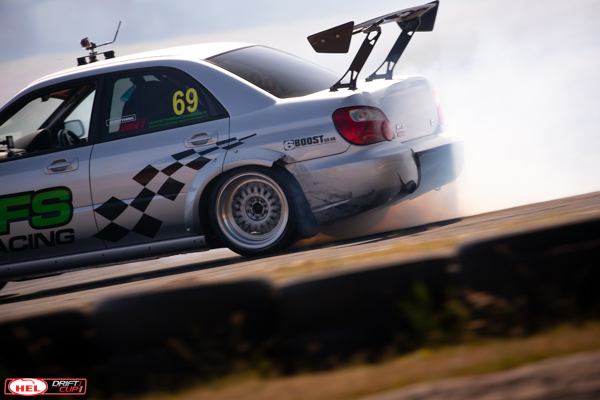 A quick transition onto clip five followed to bring the drivers onto the outside of the final corner and maintain it around to clip six at the exit of the corner. The championship battle was looking like Dave Bastin could run away with it as we started the day but with the rest of the drivers aiming for the top 8 places it would be anything but easy to lock out the championship at this round. The level of driving shown in each of the rounds has improved this year, so much so that in practice it’s often difficult to pick out the top drivers from the rest of the field. 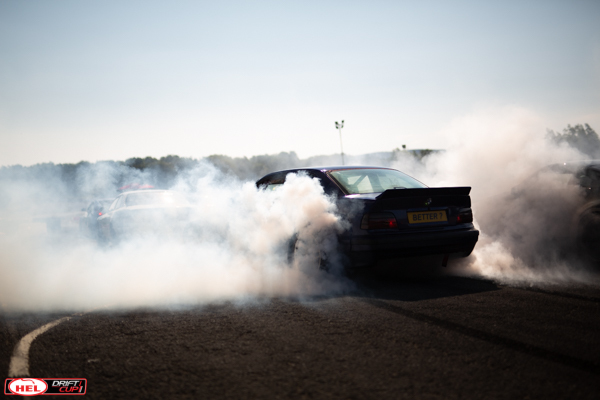 The practice session saw everyone pushing hard to get onto the correct line around the track with several drivers finding out what happens if you enter with too much speed at clip one. 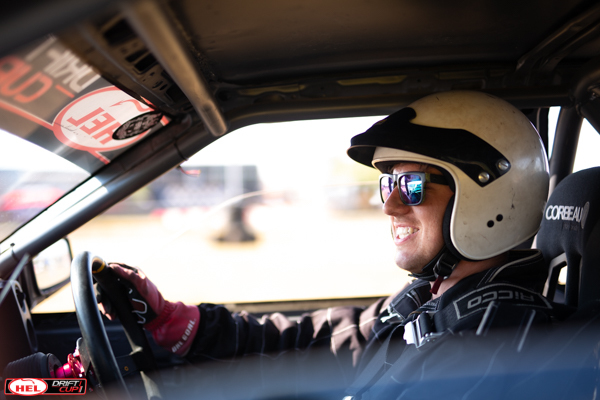 It was soon time for qualifying, by now the heat was starting to get to everyone, Danny Whyman overcame the pressure to take first place with his first run scoring 77 points. 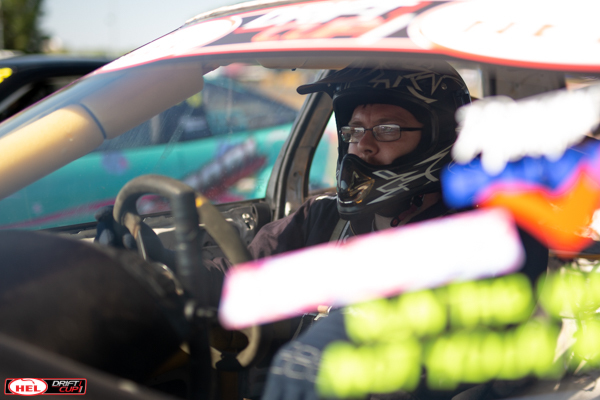 Andy Frost had a great run, narrowly missing out on first with his second run scoring 76 points. 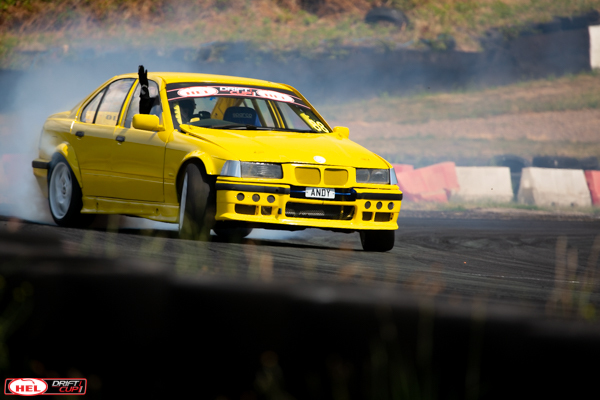 Owen Atkinson took third place, also on 76 points, a great score for the local driver. 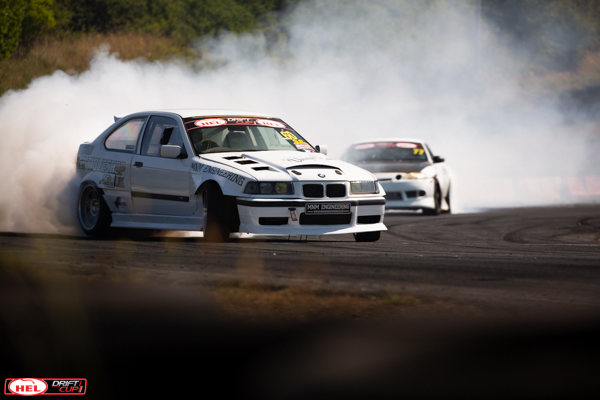 The drivers had a short break to prepare their cars for the afternoon’s battles which kicked off with James Rayner beating Zane Gittens. Ian Wyatt was having a great event having qualified for the first time this season, he used the momentum to beat Ashley Jones in the Top 32. 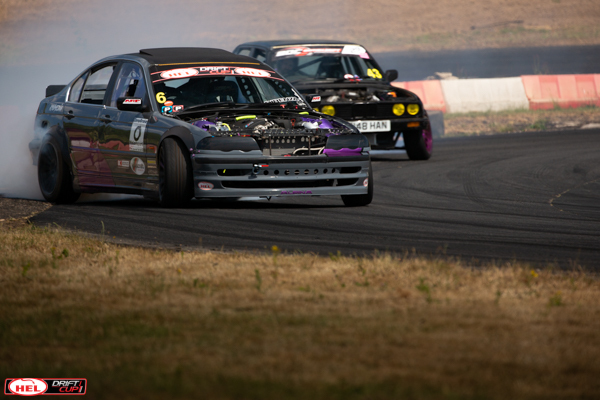 Top qualifier Danny Whyman was really showing his determination for a good result at this round as he battled Dan Collins, running on his door throughout the run and earning his place in the Top 16. 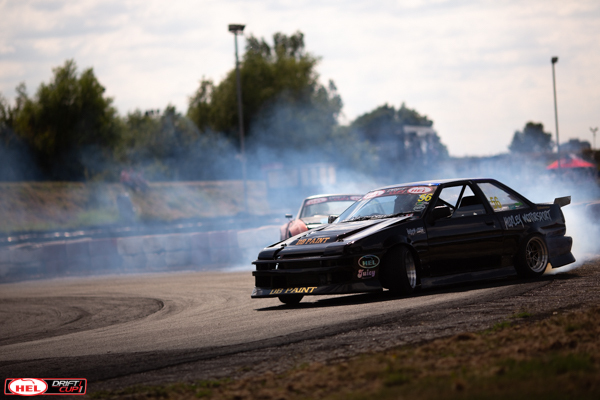 Craig Taylor was having another difficult round, he has been driving well this season but the car always has issues, this time it was the gearbox so his solution was to increase the tyre pressures and run in fourth gear against Chris Wright. It was a great battle to watch but Chris would be advancing to the Great 8 this time. 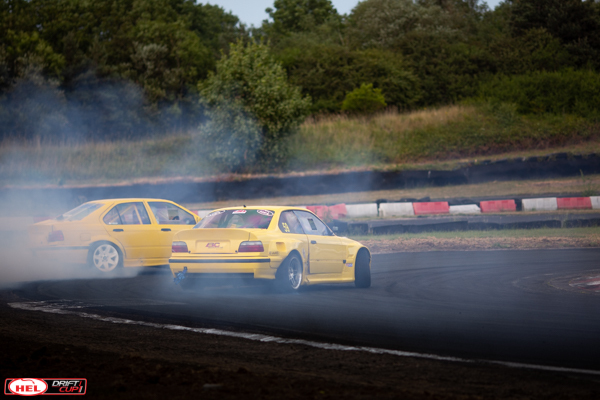 Andy Frost lined up against newcomer Shaun Winter in the battle of the yellow E36s, both drivers peddled well but Shaun couldn’t stop Andy Frost from advancing through to the next battle. 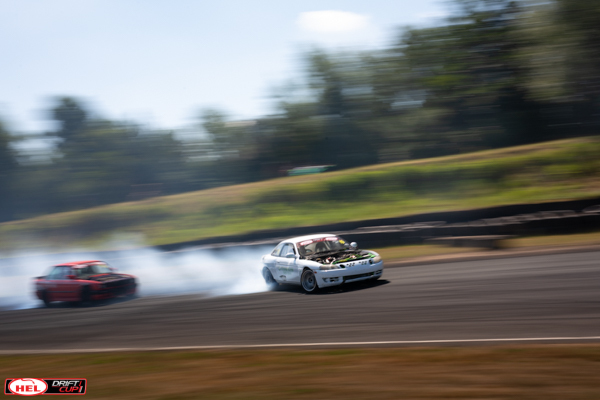 Dave Bastin was showing how quick his AE86 could be around the track in his battle with Will Foxwell, pulling a huge lead that couldn’t be overturned once they swapped over. In the Great 8 we saw Ian Wyatt exit the competition against Chris Wright, he will be happy with that result anyway. 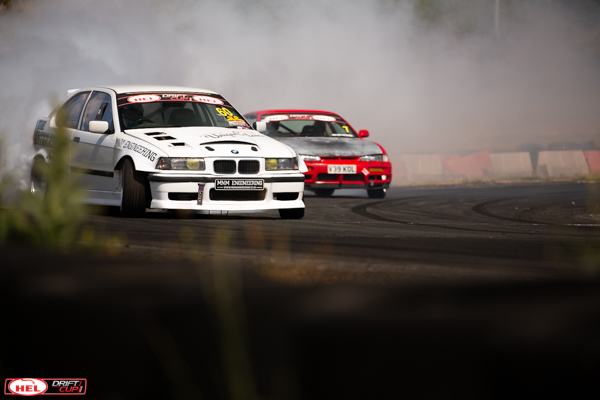 Andy Frost joined Chris in the final four as he beat Chris Arnott with a great display of close proximity drifting whilst chasing. 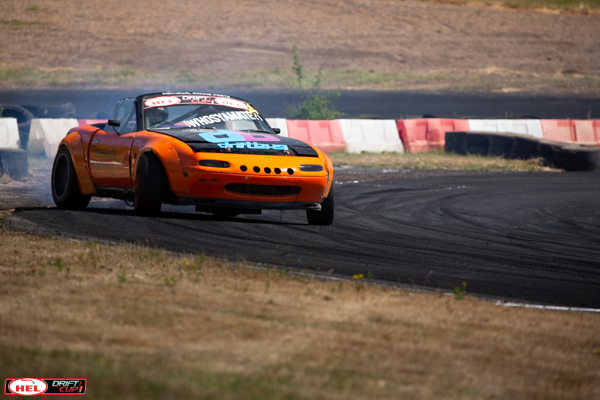 One the other side of the battle tree, Dave Bastin beat local driver Owen Atkinson whilst Danny Whyman rounded out the final four after beating Gareth Rodgers. 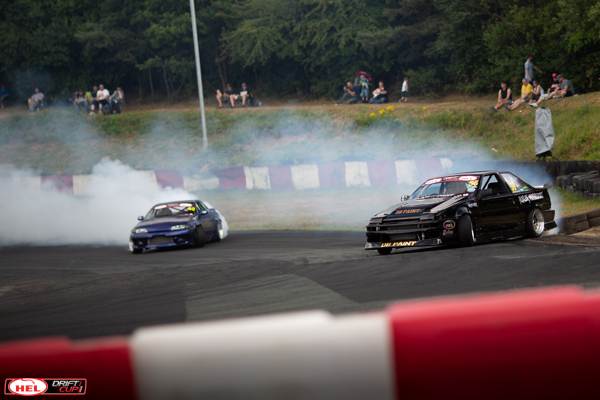 Chris Wright and Andy Frost lined up to battle next with the winner advancing into the final. 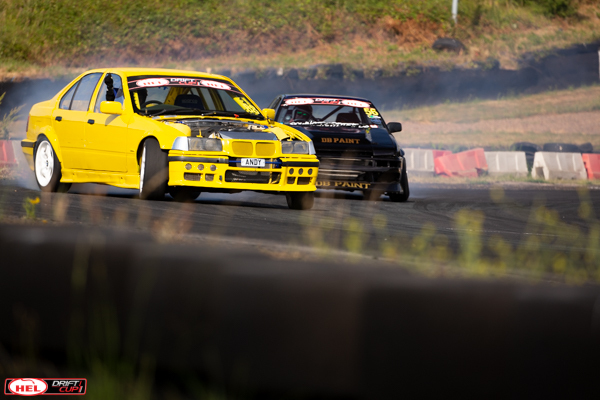 Both drivers pushed hard on both of their runs, Andy Frost had the edge but who would he line up against in the final? The battle of the teammates would decide it, Danny Whyman vs Dave Bastin. 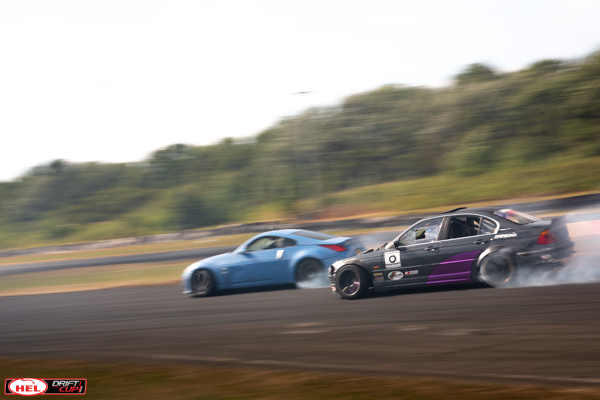 This was a battle that nobody wanted to miss, they stuck on each other’s doors throughout the runs, physically pushing each other around the track! The judges sent them ‘One More Time’ as there was nothing between them, this time Dave Bastin managed to take the win and a place in the final. 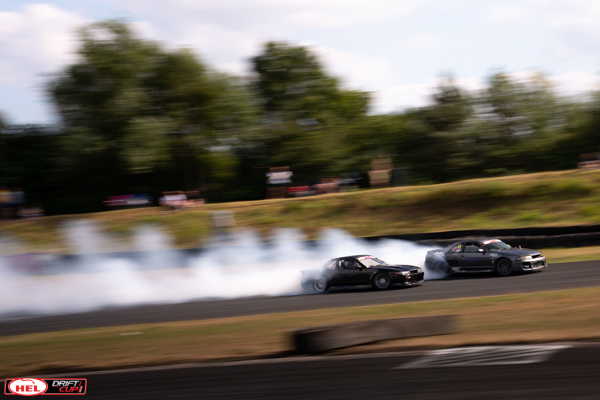 Both drivers were ecstatic with the battles and it was amazing to see the respect that these guys have for each other as they laughed about the amount of marks left on the other driver’s car! 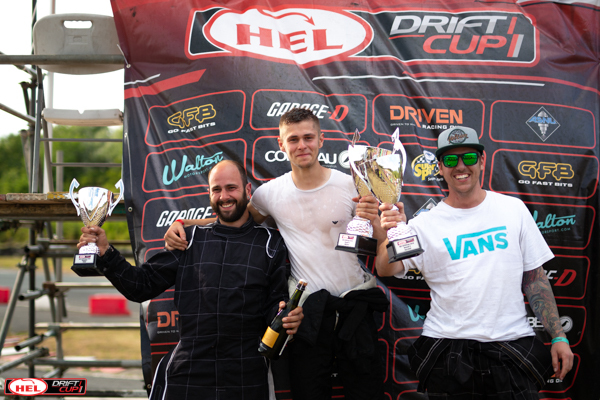 Danny Whyman took on Chris Wright for the final place on the podium, it was a close battle but Danny had another strong set of runs, securing third place. 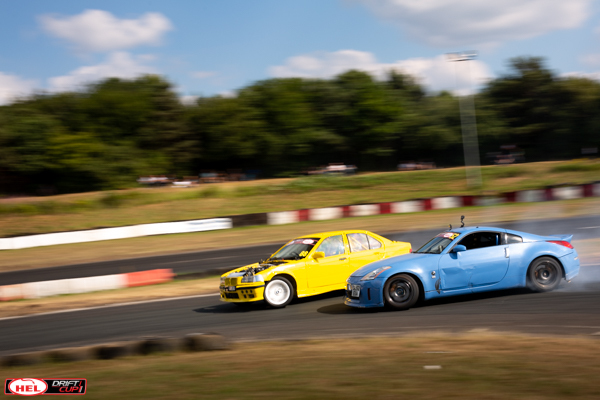 The final battle saw Dave Bastin battle Andy Frost, both drivers had been performing well all day but Andy Frost took the win when Dave misjudged his speed entering the hairpin hitting Andy. All three drivers on the podium couldn’t have been happier with their results as they celebrated, surrounded by their fans, family, team and supporters. Paddy Byrne was awarded the Driven Racing Oil Hard Charger trophy for his impressive driving throughout the event, he had qualified in 8th place with a score of 67 points, What’s more impressive is that his car is an automatic with hand controls! 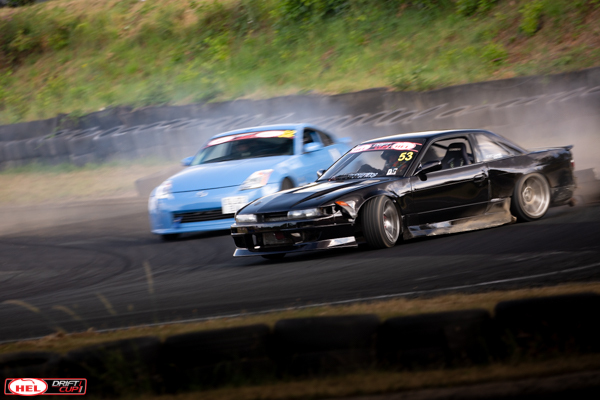 The championship will now be decided at Driftland on September 2nd. We can’t wait to see who will be crowned champion.